Cristofori Music School is proud to present Sungha Jung Live in Singapore. 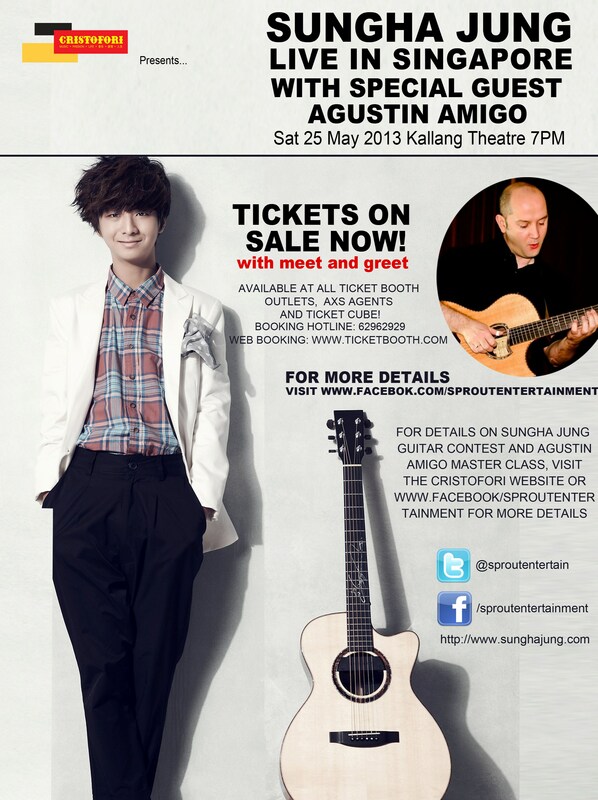 Sungha will be supported by Spanish Maestro Guitarist Agustin Amigo for the show. This billing features two of the world’s top guitarists, and is set to be the biggest guitar event of the year. Sungha Jung is a 17 year old YouTube sensation hailing from South Korea. In five years, he has composed, arranged and performed almost 500 songs across a diverse array of genres like K-Pop, Jazz, Contemporary, New Age, Pop and Classical. Among others, he has covered songs by well-known outfits such as the Carpenters, Beatles, Jason Mraz, Bruno Mars, 2NE1, BigBang, Adele and Whitney Houston. Known for his boyish charms, the teenager has more than 400 million views on his YouTube channel. Fans are keenly following the progress of this rising star as his music continues to evolve and inspire generations of youths around the world. 2013 is a special year for Sungha. He recently released his third album and is doing his third tour in Singapore. Come to the show expecting renditions of your favorite K Pop artistes (such as 2NE1, Big Bang and SNSD), in addition to his famous originals and cover arrangements! Agustin Amigo is a passionate solo acoustic guitarist and singer songwriter. His guitar arrangements and compositions are characterized by beautiful melodic phrases and dynamic, emotive playing. His uplifting performances on YouTube have garnered more than 1.5 million views, making him a firm favorite of serious guitar fans worldwide. Both Sungha Jung and Agustin Amigo perform a type of guitar music known among enthusiasts as fingerstyle. In this virtuosic style of music, the guitarist uses the guitar much like a piano, and proceeds to perform the melody, bass, accompaniment and percussion all on a single instrument. Sungha Jung previously performed in Singapore last May to 2 sold-out crowds at the DBS auditorium. Agustin Amigo will be here for his maiden show. In the lead up to the concert, Cristofori Music School will be holding a Sungha Jung Guitar Competition and an Agustin Amigo Guitar Workshop for the fans. The guitar competition will be judged by Sungha Jung and Agustin Amigo. Both events are open to the public. Details will be provided on Sprout Entertainment’s Facebook in April. Tickets are priced between $48 and $88, and are available at Ticketbooth from 22 March through their website, phone hotline, Ticketbooth Agents and AXS Machines. 200 VIP Meet and Greet tickets will be given fans, chosen from buyers of the first 800 tickets through a balloting process. Do follow Sprout Entertainment on Twitter and Facebook for latest updates of this event. Golden Village to screen Shinhwa Live 3D The Legend Continues this March!